Tolomatic's new RSX hydraulic-class electric linear rod actuator meets the need for extreme forces and is an ideal choice for replacing hydraulic cylinders. 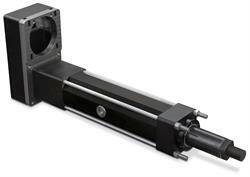 Designed and tested for 100% duty cycle, the actuator's roller-screw drive ensures long, consistent life. Applications include pressing, punching, stamping; riveting, fastening, joining; injection molding; and sawmilling. About this company Tolomatic, Inc.
Tolomatic's new hydraulic-class electric linear rod actuator meets the need for extreme forces and is an ideal choice for replacing hydraulic cylinders. Photo: Tolomatic, Inc.